One of the synth-pop era’s most innovative, infectious, and flamboyant acts, Erasure has spanned two-and-a-half decades with constant rotation in the clubs, with the occasional, percolating radio smash. Despite changing times and tastes, the duo – frontman Andy Bell and keyboardist Vince Clarke – appears to be back in full swing following a four-year break. The return, Tomorrow’s World (Mute), provides a decadent throwback to those pulsating, ’80s salad days, but also a fresh and futuristic bent that confidently contends with Lady Gaga or La Roux upstarts. Appearing: September 16th and 17th at Congress Theater in Chicago with Frankmusik. As for the sounds contained therein, there are plenty of throbbing beats, bubbly grooves, and Bell’s florid falsetto, though the carefree tunes also benefit from the current touches of producer Frankmusik (a.k.a. Vincent Frank). The ascendant 25-year-old has already notched remix credits for Lady Gaga, Pet Shop Boys, and Far East Movement, while his upcoming sophomore solo record looks to best the top-20 success his debut had in the U.K. Though the disc clocks in at just over a half hour and spans a mere nine songs, there isn’t a letdown in the batch, truly standing out as Erasure’s strongest project of this millennium and arguably the best since its glory years. The album serves as a bookend to 2007’s Light At The End Of The World, which marked a much anticipated return to the dancefloor. The decade began with a string of specialty projects, including 2003’s covers-centric Other People’s Songs and 2006’s country rearrangements record, Union Street – which may have allowed the pair to break a monotonous cycle, though it left some pent-up fans with their arms folded. 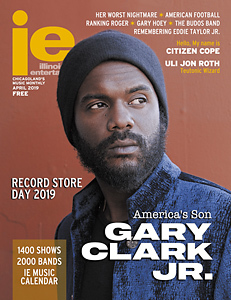 To read the full story, grab the September issue of Illinois Entertainer, free throughout Chicagoland, or click the cover of the new edition on our homepage.